COLUMBUS, Ind. 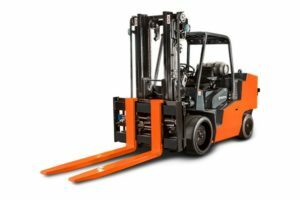 – Toyota Material Handling, USA (TMHU) has launched Toyota 360 Support. “This is a promise to our customers that Toyota and our dealers will always be there to deliver a superior product, superior service and the strongest dealer network in North America,” said Bret Bruin, TMHU director of aftermarket operations. Toyota 360 Support Plus, an enhanced aftermarket program aimed at providing cost savings and budget management tools for customers, comes standard with a year of planned maintenance, carriage-to-counterweight coverage up to three years/6,000 hours and five-year major component coverage. Toyota 360 Support Plus is available with four and five year carriage-to-counterweight coverage. The upgraded program includes discounts on T-Matics mobile, Toyota’s system for fleet data collection and analysis. T-Matics tracks performance to assess forklift conditions, maintenance scheduling and identifying opportunities to increase efficiency.